The wonderful valley of dreams. (Susie Mitchell, Recollections of Lamorna, 1977). At the time, this was one on the worst winters in living memory... I remember the day it started towards the end of January. I was at school at St Erbyn's in Penzance and I remember that it had been raining for much of the day until about 3.00pm when it started to snow. People were saying 'Oh it won't settle because the ground is too wet.' It continued snowing and it started to settle. My father picked me up from the school at about 4.30pm and we headed for home at Lamorna. We just managed to get up Paul Hill with lots of slithering but the rest of the run to Lamorna and up Well Lane to Tregurnow Cliff was less of a problem. It continued snowing steadily all night. Next morning we woke to a blizzard, and looking out of the window onto Cliff Field was like seeing the North Pole. The wind was blowing fine snow into drifts. After breakfast I wrapped up warm and went out into the blizzard where the general level of the snow was up to the top of my boots, that is to say, about a foot deep. After that it snowed intermittently for several weeks and the cold increased. 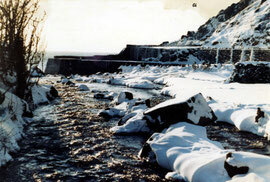 Lamorna was completely cut off and I couldn't get to school for four weeks! We children had a wonderful time tobogganing and making ice slides. Normal road transport was impossible and teams of sledgers brought supplies via Castallick from Newlyn to the village shop at Lamorna. For us children it was a lovely winter holiday. Estelle Fox’s family, the Hoskings have lived in Kemyel Mill for more than 500 years. Estelle herself was born in 1929 and has always lived in Mill House. Estelle and her husband James have grown daffodils, narcissus, little pink gladioli (whistling jacks) and iris, some picked some packed for shops, others sold from jugs sitting on the steps outside their cottage. They opened the mill as a craft shop in the 1970s. The lowest pool, now almost dry, is like a tropical jungle with huge gunnera. Sun glows through the leaves like stained glass. Estelle’s ducks cross the road to the Lamorna stream. It’s a magical place. 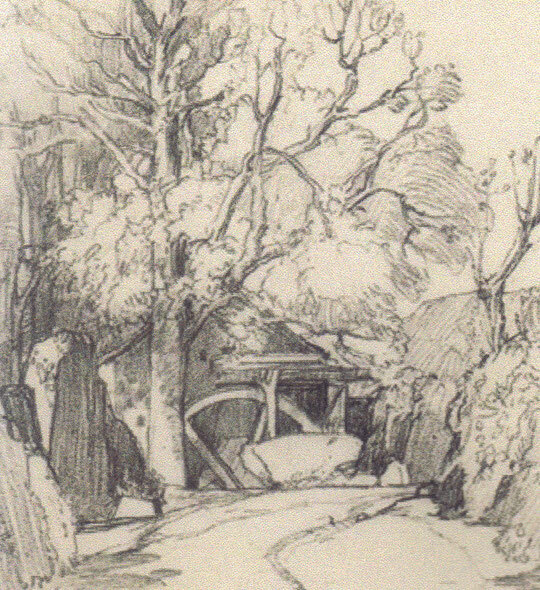 ...Many books have been written about some of the Lamorna painters, far more in depth than here. But these memories and observations are unique to me- a Lamorna boy! 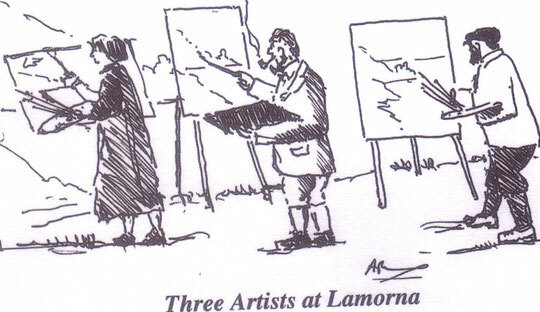 Being the son of one of the second generation of Lamorna painters! 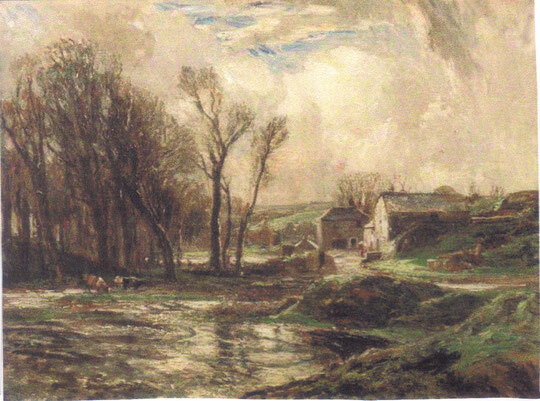 It was a lovely late November day ‘a day lent’ as the Cornish say, when my father (Stanley Gardiner) walked into the Lamorna Valley, and thought he had found a painters paradise. The autumn tints were still on the trees and the cove was looking its best with the sea a Mediterranean blue. 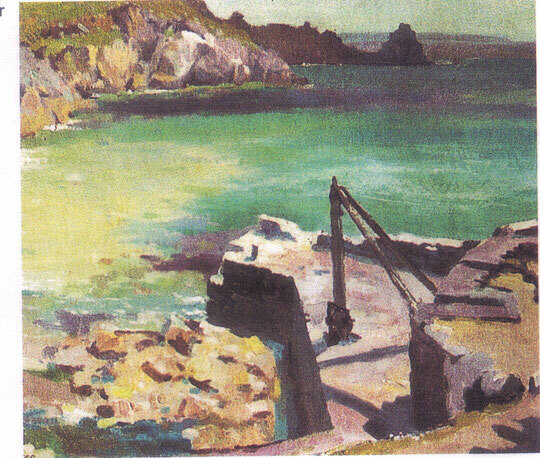 The fine weather had brought two or three painters out, who had set their easels up in various positions around the cove, and the one my father got in conversation with happened to be Lamorna Birch, none other than the founder of the Lamorna colony of artists. 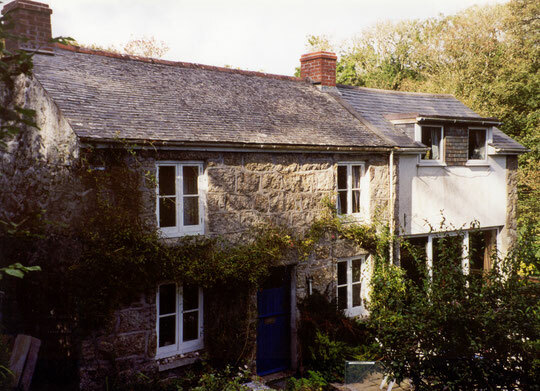 Six months after this meeting my parents were living in Lily Cottage, by the stream at Lamorna; and eleven years later, in 1934, I was born. I grew up in Lamorna, spent ten years travelling around and have been here ever since. I got married to Christine (my late wife) in 1961 and came back to Lamorna in 1967. I always kept my interest in painting and would have periods in my life when I painted and I was lucky to have my father’s studio to work in. I painted when I came out of the Air Force, when I was diving and mining. (Keith Gardiner, A Painters Paradise, Memories of an artist son growing up in Lamorna). ‘The Wink’ stands on the Cove Road in the centre of the village. 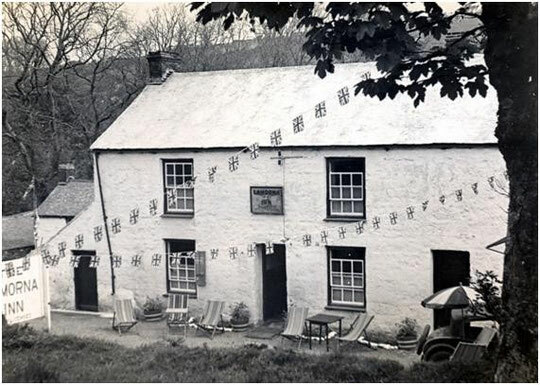 It was a home to Bob and Di Drennan, Alice, the Jack Russell and an ancient cat. The 21st century traveller, whether visiting the Cove and Valley by car or walking the coastal path and sunken lanes, could rest in this oasis, enjoy bar food and Cornish ales and relax in a traditional pub atmosphere. The bar walls and ceilings were full of nautical memorabilia collected by Bob over the 41 years that he and Di were landlords, until 2013. The Lamorna Wink was a popular drinking spot for the cast of the Summer in February film during production - as the likes of Dan Stevens and Emily Browning adapted a novel by Jonathan Smith, based on the famous artists who lived in the area at the turn of the century. (The Lamorna Oral History Group,Some Lamorna Voices, 2000). Do you know when this photograph was taken?